State of the Heart is offering Student Grief Groups for students in grades 5-12. If there is an interest in finding out more, click on the link to complete the questioniare. The groups will meet during the school day at their respective building. For more information ask your school counselor. 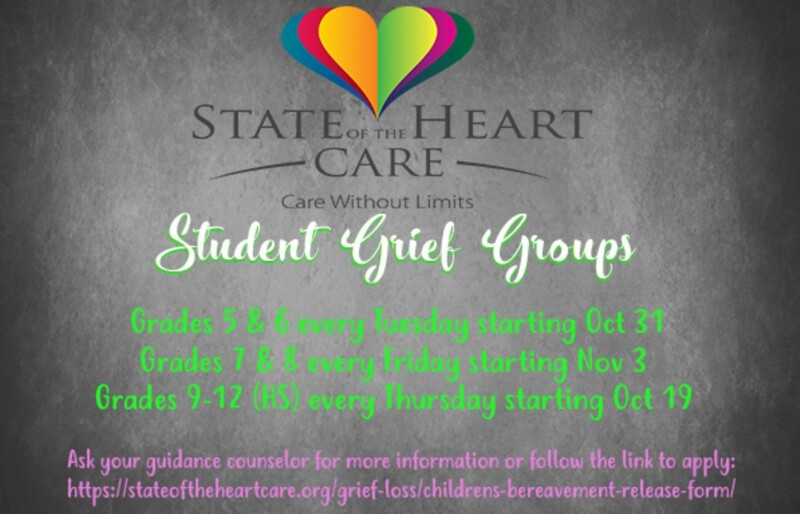 https://stateoftheheartcare.org/grief-loss/childrens-bereavement-release-form/State of the Heart is offering Student Grief Groups for students in grades 5-12. If there is an interest in finding out more, click on the link to complete the questioniare. The groups will meet during the school day at their respective building. For more information ask your school counselor.